As Greek city-states grew there began a need for protection from other Greek poleis and roaming bands of other civilizations. Homer was the first to describe the soldiers and how they used their formation in the Iliad with each soldier standing next to one another working together as one unit. 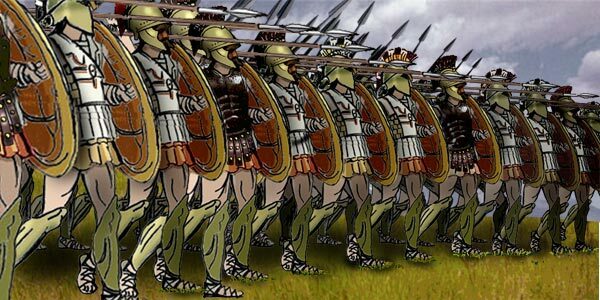 This formation was called the phalanx where each soldier, who was known individually as a hoplite, would stand side by side one another with their shields (known as the hoplon) on their left side also covering up the right side of the soldier next to them while they held their spear on their right. Many Greek civilizations favored the ways of the phalanx and would be used by Greek city-states such as Athens, Sparta, Thebes, and later on Macedonia. Most soldiers would be armed with a shield (the hoplon) and a spear, but because of the high cost of bronze at the time there were soldiers that could not afford to gain other assets of armor. Each army would have a series of different classes that were distinguished by the amount of armor they were wearing the lower class would only have a shield and spear and possibly a helmet. The middle class would have a cuirass, called a linothorax because it was made out of layers of leather and linens, which was and armored chest plate and the upper class had a full armored outfit which included a bronze cuirass, greaves to cover their legs, and a bronze shield and helmet. As the soldiers entered battle they stand ready with their shields holding off an opponent’s charge while the row in front held off the enemy they would attempt to jab at them with their spears. The row behind them would back them up by jabbing their spear between the soldiers trying to take out charging enemies. 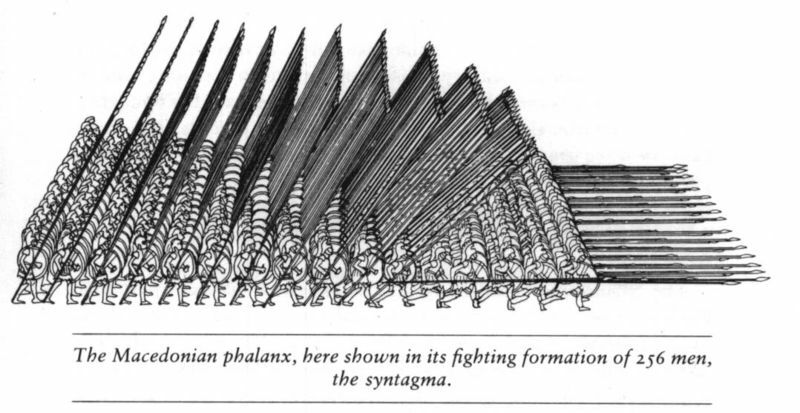 Initially the phalanx formation was a giant pushing match where each army would continue fighting until one of the army’s lines broke. In a phalanx formation there was a large weakness to the left of the formation because the lines could not continue and there would be no one to guard the left flank. The need to make changes started in the Persian War at The Battle of Marathon (490 BCE) where the outnumbered Greek army, led by Miltiades, stretched their lines to make sure they were not outflanked by the greater Persian army. By stretching his lines Miltiades reinforced the wings leaving the center more vulnerable, but the Greek army was able to defeat the opposing Persian wings and focus on the center which led to their victory against the Persians. Many changes were made over the years in many wars from the Persian Wars to the Peloponnesian War, but it wasn’t until King Philip II of Macedonia that there were implemented changes to the formation. King Philip had grown up in Thebes where he studied the use of the phalanx formation used by the city here he would come up with ideas to better the formation in Macedonia. One issue he found was that the formation was very difficult to move because armor was made out of bronze and the shields in the original Greek armies were about the size of half their bodies each soldier carried most of the utilities which weighed about 50 to 60 pounds these maneuverability difficulties allowed for other armies to take advantage of their weakness. In case of flanking enemies from further study he made the shields in his army smaller and the spears were extended to about six meters, these were known as sarissas. By reducing the size of the shield the army was made more maneuverable and able to flank opposing armies. Alexander the Great later made his implementations the formation by adding a cavalry to cover the right flank of the army so that they were better protected from enemies attacking their flank. In the Battles of Issus (333 BCE) and Chaeronea (338 BCE) Alexander was able to use his cavalry to attack the Persian army’s wings and use the rest of the phalanx formation to attack the center many armies fell to this strategy which led to the legacy of Alexander. There were many other issues that the phalanx experienced was that it could not be used in an open plain or on hills because they would break the lines. Also if battles were to last long which most lasted from 30 to 45 minutes the Greek forces would experience exhaustion. The Battle of Heraclea the Greek army experienced this difficulty against a new opponent in the Romans. The Roman army was defeated but they were able to stretch their lines a lot more than the Greeks who had trouble in replacing their soldiers in the front line. In 197 BCE at Cyonscephalae the Roman commander Titus Quinctus Flaminius defeated King Philip V of Macedonia by using the strategy of replenishing his troops in the front line and exhausting the Greek phalanx leading to the defeat of the Greeks and superiority of the Roman army.